In line with the previous quarters’ slowdown, Kolkata’s housing market failed to register any growth in Jul-Sep 2016. 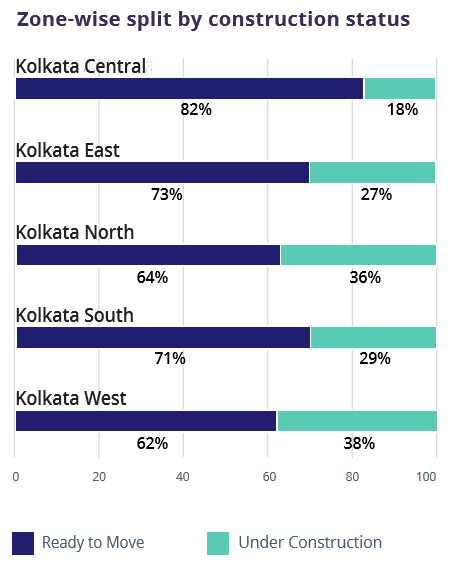 A few localities that performed well on the capital graph included Jadavpur and Beliaghata with seven and six percent increase in ‘ask’ rates QoQ, respectively. The localities benefited on account of proximity to the railway station and upmarket neighbourhoods. The resumption of Joka-BBD metro link stimulated demand and helped capital rates in Joka surge by five percent, QoQ. Sodepur in North, scored over its expensive counterparts such as Shyamnagar and Naihati and magnetized buyer base with limited budgets. Action Area III in East gained from the presence of IT parks. The rental market in Kolkata remained upbeat due to the migrant working population but did not register any growth in average rental asks YoY. The high-density housing belt of Patuli witnessed a robust rise of 13 percent in rental values, YoY. Metro connectivity, self-sufficient infrastructure and rising demand from the tenant community pushed the prices up. 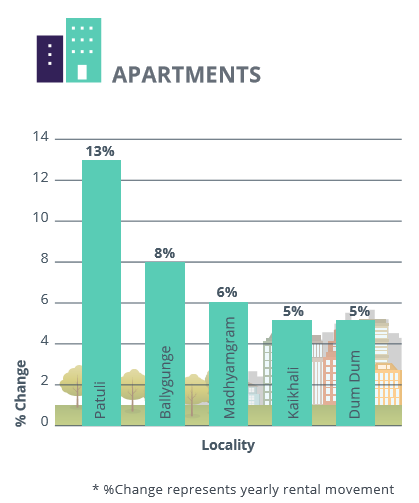 Ballygunge followed suit with an eight percent increment in rental values YoY. Flanked by upmarket neighbourhoods such as Park Circus, rental values here are likely to increase further. 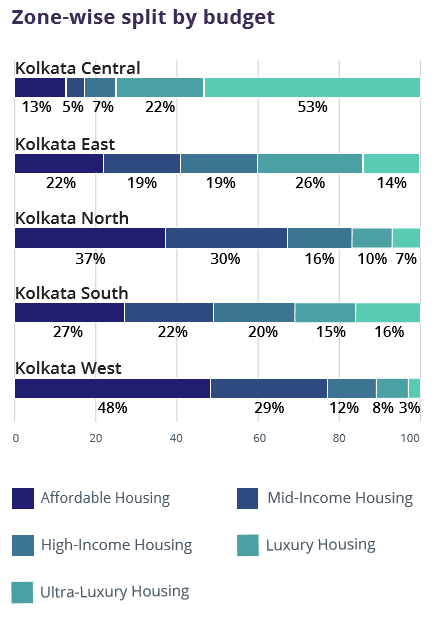 Other localities that led the rental graph include Madhyamgram, Kaikhali and Dum Dum, with a six, five and five percent hike, respectively, YoY. 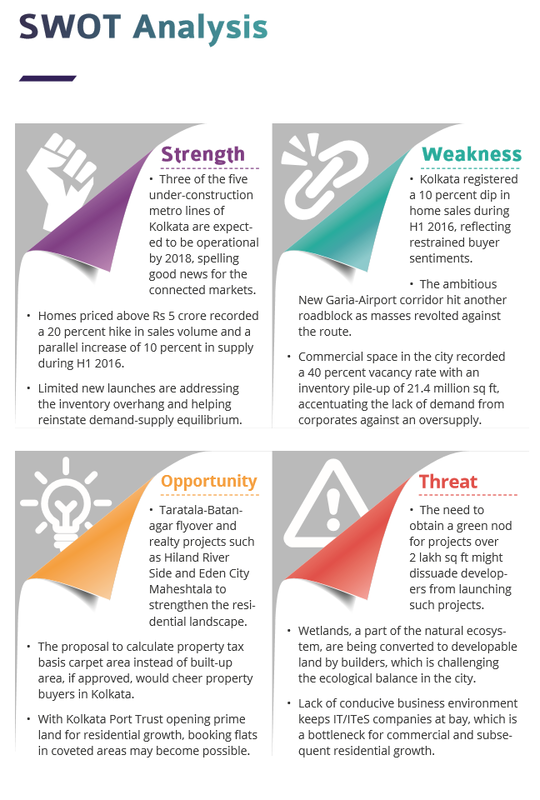 While housing market sentiment in Kolkata remains subdued, demand-supply mismatch, particularly in the luxury housing segment, continued to keep average property prices soft and the developer community in trouble. Amidst very few new project launches, the market swarmed with resale inventory. 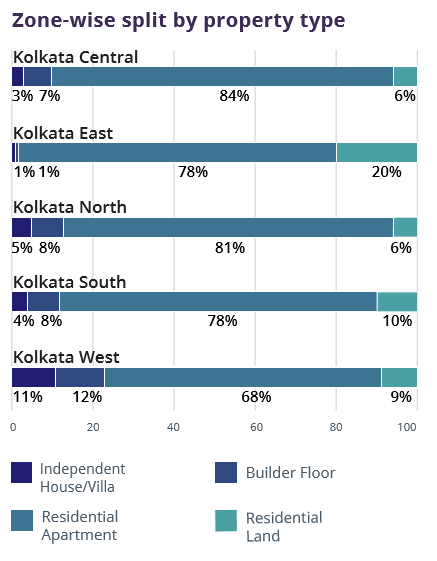 Residential apartments in Kolkata constitute almost three fourth of the total housing supply. The demand for this property type was a little short of its availability in Jul-Sep 2016. Independent houses/villas captured just 12 percent of the total residential stock in the market, falling short of its demand by almost eight percent. Availability surpassed demand in case of residential land by five percent, highlighting homebuyers’ aversion to invest in plots. 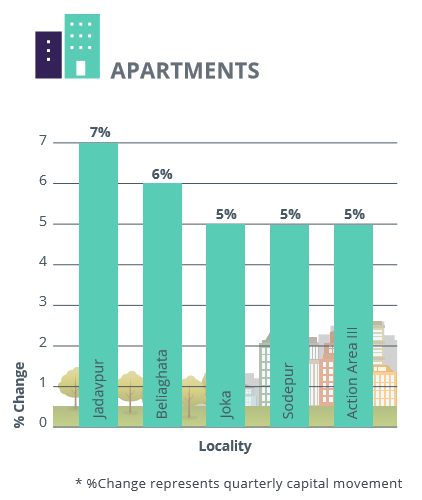 While the supply of apartments was evenly distributed across Kolkata, the eastern quadrant housed the maximum number of such units. The demand for affordable homes is on a rise in Kolkata. It is reflected by a 13 percent surge in the preference for homes priced within Rs 25 lakh in Jul-Sep 2016, as against Apr-Jun 2016. Western Kolkata harbored the maximum housing stockpile in the affordable category with localities such as Konnagar, Hooghly, Bally, Andul and Hindmotor offering apartments at an average ‘ask’ price of Rs 2,400 per sq ft. The supply of such properties is, however, down by four percent compared to the previous quarter. The demand for luxury housing in the city remained meek at four percent in Jul-Sep 2016. Crowning the title of the least preferred housing segment in the city, developers struggled to find takers for the existing premium housing inventory. The single-family market, and buyers with limited budget continue to make gradual gains contributing to the rising popularity of 1BHK segment in the city. Demand for these units asserts a marked increase of six percent QoQ, while 2, 3 and 4BHK apartments witnessed a fall in popularity between one and three percent, each. The demand-supply disequilibrium for 1BHK units widened further in Jul-Sep 2016, accentuating limited launches in the segment by the developer fraternity. In line with the previous quarters, the 2BHK reservoir in the city fell short of its demand by six percent. Housing belts in North and West Kolkata offered over half of the total supply of 2BHK units in the city. 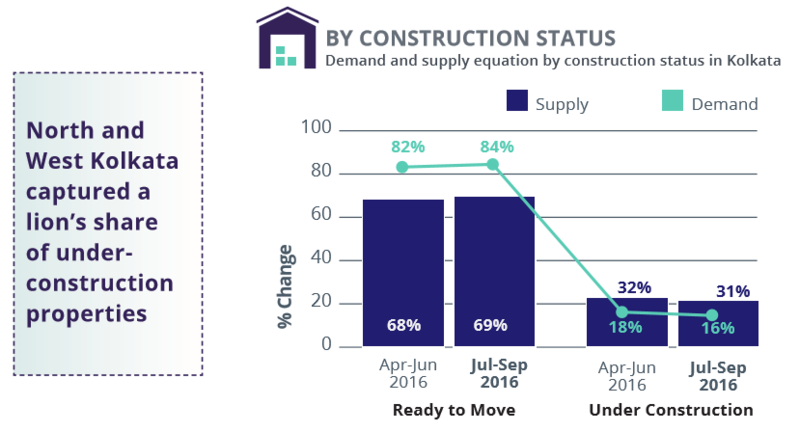 As incessant project delays continued to fuel the wave of distrust among homebuyers, demand for under-construction units receded. Jul-Sep 2016 testified a 15 percent shortfall in demand for these units. The safety associated with ready-tomove-in properties resulted in a rise in their popularity. Ready units in Kolkata documented a demand of almost 85 percent in Jul-Sep 2016. The supply, however, remained short by 15 percent. 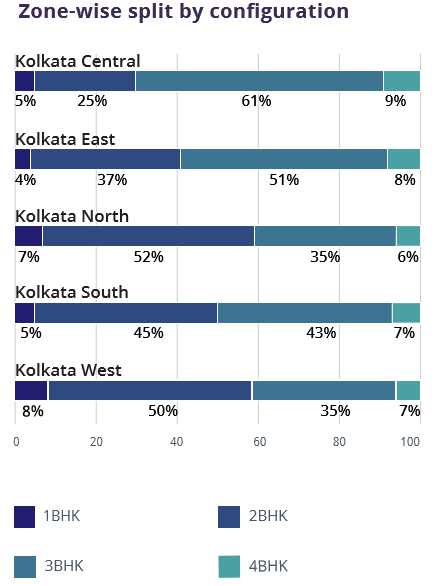 Housing hubs in East and Central Kolkata such as Salt Lake City, New Town, Garia, Park Street and Sealdah, led the availability of ready-to-occupy properties in the city. Most of these localities are well-established and primarily dealing in resale transactions.